I’m crazy about data because it’s what allows me to help businesses make smarter decisions and get the most out of their advertising budget. My name is Khurram Abbasi, and I’m your next Digital Marketing Consultant. Howdy, I’m crazy about data because it’s what allows me to help businesses make smarter decisions and get the most out of their advertising budget. My name is Khurram Abbasi, and I’m your next Digital Marketing Consultant. For over seven years, I’ve provided small to mid-sized companies with first-rate online marketing services, using my industry-recognized skills and experience in SEO, SEM, and PPC to increase search engine rankings, run effective social media ad campaigns, implement successful retargeting and display advertising strategies, and apply SEO optimization of inbound links from partner websites to increase lead generation and get quantifiable results. With pay-per-click advertising, every dollar counts, and my expertise ensures that you’ll be getting your money’s worth. I’m a Google AdWords Partner, and an expert in Google Search Console, Google Analytics, and their best practices. I’ve worked with many companies across various industries and niches, and my success rate shows that I am versatile and adaptable. Pay Per Click Strategy To tailor a PPC campaign that’s fit for you, we will get to know your business, industry sector, competitors and USP’s. Then can we work with you to manifest a strategy that’s going to produce the results you need? IMPLEMENTATION To achieve that strategy by building out existing campaigns, or securing accounts at new networks. It’s imperative to us that you own the accounts, and that you have a relationship with the network owners. KEYWORDS RESEARCH Assure you’re targeting the most suitable keywords and not blowing spend. We use refined techniques ensuring you cover the full search landscape while evading the areas which aren’t right for your business. My PPC experience spans nearly a decade, and while I currently work from home in Islamabad, Pakistan, as the Digital Marketing Manager for one of the largest independent B2B/B2C agency in the UAE, no client is too big or too small to find success through the marketing opportunities I seek out and create. AD COPY WRITING Ensure your adverts are tightly centered to the ad group’s keywords and to the landing pages on your website; with a powerful call to action and continuous testing we can be sure you’re getting the best traffic. AD EXTENSIONS Ad extensions have become a lively part of the PPC arsenal. It changes your ad text and gives you the chance to stand out, over your competitors. Not using ad extensions in today’s bid landscape, is missing a trick. SHOPPING ADS We’ll help you set up, manage and optimize your shopping campaigns and product listing ads to improve your inventory. Our experience helps us ensure the right product shows for the right keywords. I don’t just offer set services, I educate and empower businesses, teaching them the value of digital marketing, providing affordable tools, and getting rid of that ‘set it and forget it’ mentality of many companies that throw money at PPC, but aren’t using best practices. This is the digital age, and if you want to get your message in front of the right people, you need a seasoned professional who can navigate the landscape. You need me. PPC TRACKING Without the right data, optimizing a PPC campaign would just be a shot in the dark, so one of the very initial things we do is to make sure the tracking is set up correctly, giving us all the data we need to optimize for best conversion. OPTIMISATION Ongoing optimization will constantly refine and focus the campaign to push the performance boundaries. Listening to detail is the key; A slightly higher CTR in this Ad group, a slightly lower CPC on this keyword – it all adds up to make a huge difference. PPC REPORTING We provide reports which give significant insight into what’s happening with your PPC campaign. What we’ve been working on, what we’ve seen your competitors doing and how your paid search is playing against the key metrics you’re most involved in. The best place to hide a dead body is the second page of Google Search Result Page.Lets Work Together to bring life to your website. When I am not doing at all then, I am enjoying Cooking in my artistic Kitchen, or Dining out with family, or traveling the countryside with friends, or watching the Friends Tv Serial or reading Rand Fishkin and Search Engine Land articles. I love music, country music is my favorite, these keeps me fresh for working environment. 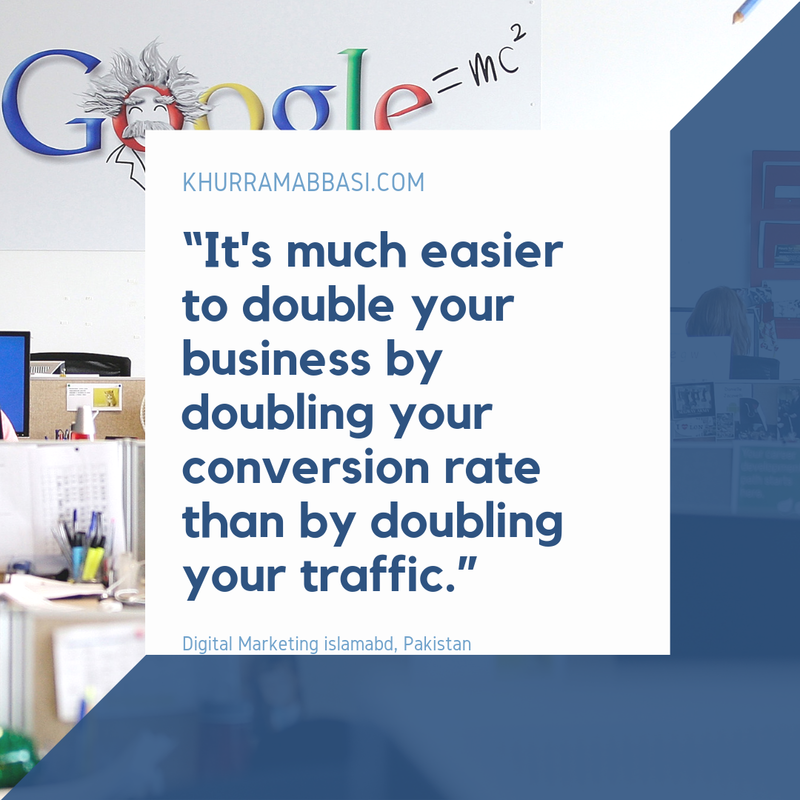 It's much easier to double your business by doubling your conversion rate than by doubling your traffic. What is Blue Whale game / Is Pakistan next ? "Why is my SEO not working" Your site is too slow ? The Death of Short Tail Keywords? With the next trend in Voice Search. Tip to Find Digital Marketing Agency / Consultant in Islamabad, Pakistan. Thank you to Khurram for helping with our Google AdWords campaign. We are happy with the work that has been undertaken and wouldnt hesitate in recommending them to others wishing to use their service. "I’m really happy with Khurram work for us. Khurram and his team really listen to our goals, and produce great content for our website! We've definitely seen a major increase in our organic traffic and organic leads because of their work." Khurram Abbasi is a well-connected professional that always takes the time to support anyone is his network. He has an impressive background and profile, and I recommend Khurram Abbasi as an expert to connect with and consider for anything appropriate. "Khurram Abbasi profile speaks for itself. I remember checking his profile when I first joined LinkedIn and I was surprised how many recommendations he got, simply he is an expert in his field. Khurram is an excellent resource and a master at. He has been a tremendous asset to our company and contacts and has frequently facilitated introductions and other direct contacts." Whether you’re a potential client, or a fellow professional looking to connect, please reach out to me on any of my social media to start a conversation, or find out what I can do for you. See you in cyberspace! Contact Me, Before Your Competitors Hire Me.